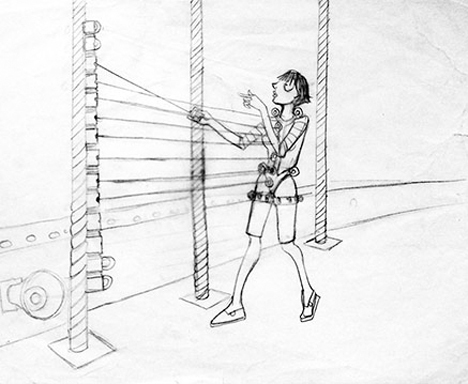 Bridge-Bow Device that will cause the hanger to vibrate by being struck by rubber balls. The striking action is caused by the Movician pulling on a retractable string housed in a pulley built from a modified dog lead. No electronics are used. The Bridge-Bow is constructed from sheet aluminium. The hanger is protected by a PVC collar lined with rubber. The Pulley for Bridge-Bow is secured by a rubber Hang-On and carabiner in an identical fashion as the Digi-Bow. The Bridge-Bow is to be placed 1/7th of the way up each hanger. Digi-Bow The Digi-Bow controls the sound generated by the hanger it is attached to. The sound generated by the Bridge-Bow is captured by the contact microphone connected to the Digi-Bow. This audio is passed on to the Hub. The Digi-Bow contains a Pulley constructed from a modified dog lead as used in the Bridge-Bow. The length of string extracted from the pulley is captured by a rotary encoder and the angle that the string is extracted is captured by a gyroscope. This circuitry is largely contained to the Tech Dome attached to one side of the pulley and protected by a 3D printed dome. The Digi-Bow is attached to the hanger with a rubber Hang-On and carabiner. It receives power from the Hub and sends the Hub the data the string generates along with the audio from the contact microphone. Hub The Hub houses the computer processing the audio captured by the contact mic and the control data generated by the Digi-Bow. Installations like the Human Harp can easily fall victim to appearing to be a backing track when the action of the Movician isn’t obviously tied to the sound generated. To tackle this, the sounds generated from an individual hanger will emanate from a speaker as physically close to that cable as possible. The loudspeaker will be UE MEGABOOM, an off-the-shelf speaker with an integrated rechargeable battery designed for outdoor use. It will be connected to the Raspberry Pi with a 3.5mm stereo audio cable. 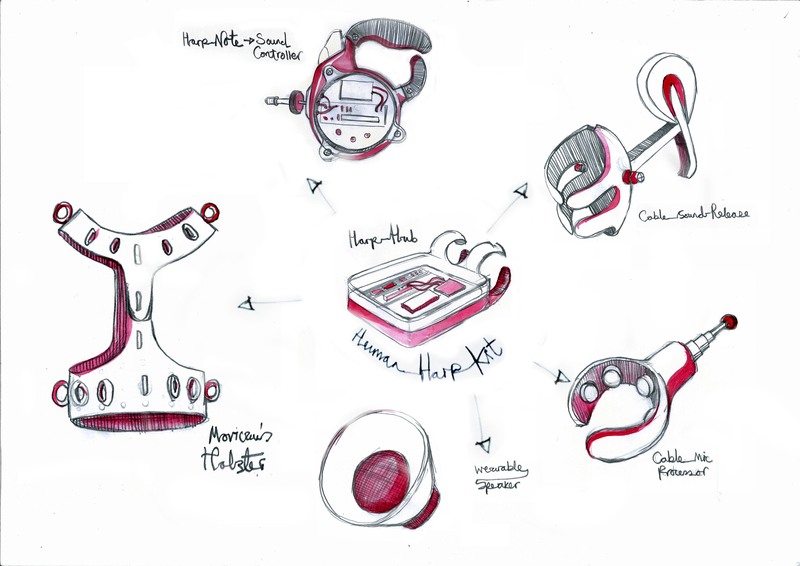 The Hub houses the rechargeable battery that powers all the electronics in the Human Harp with the exception of the speaker. 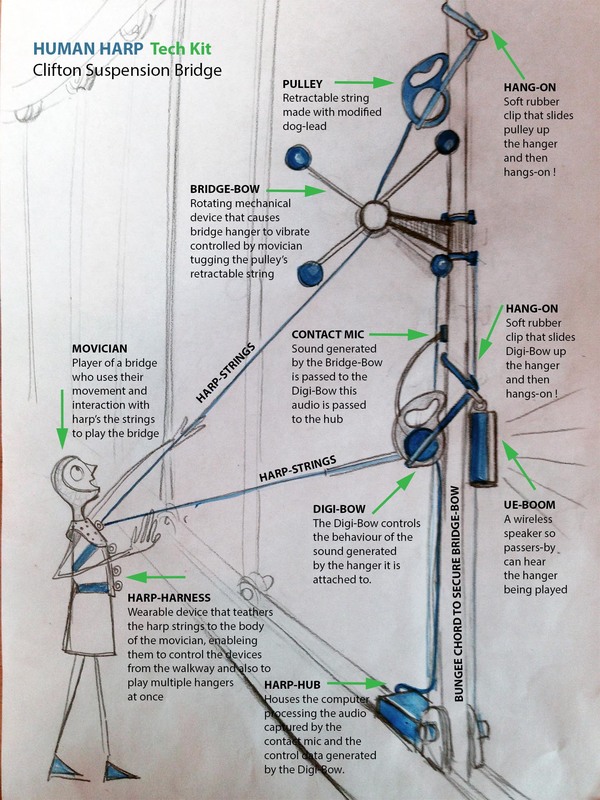 Harp-Hoist A modified extendable pole with a 3D printed Harp-Hook at the end, to allow easy installation of the the parts of the Human Harp that are attached to the hanger without needing heavy-equipment such as scissor lifts. Harp-Harness A garment worn by Movicians during a performance. It contains a number of integrated pieces of hardware that let the Movician easily attach multiple strings to their body. What are the best sensors to map string acceleration, length and angle? 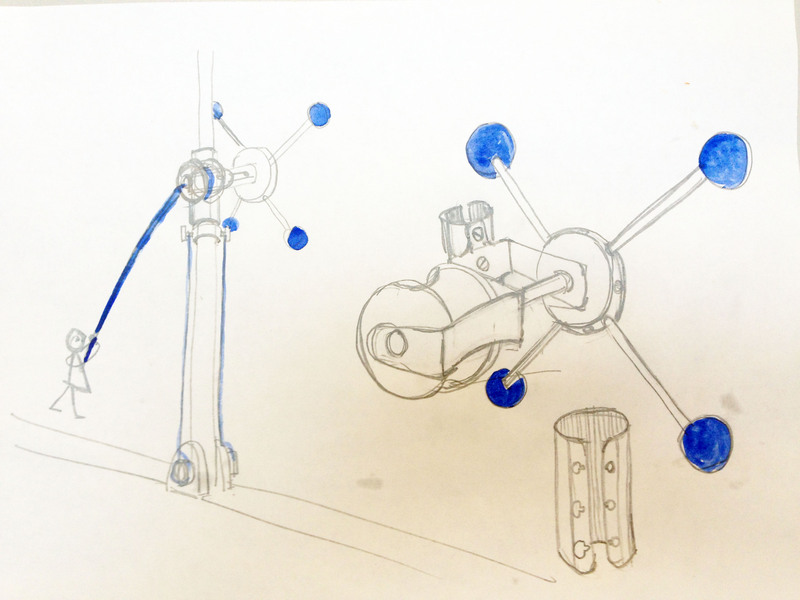 How do we make each module robust, watertight, and sustainable and fab-lab makeable? How do we compress each harp module so that it can fit in the palm of the hand for portability and swift assembly? How do we develop portable clip-on speakers (to attach to the body and architecture) for harp performances in noisy public spaces? 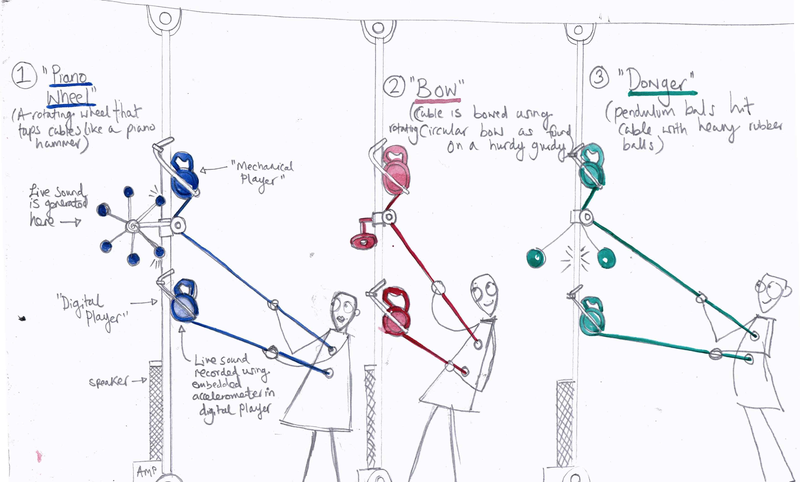 How do we make the Human Harp wireless and self-sustainable for public intervention without the need for associated hardware?